This week I have something very exciting to share: the cover art for my forthcoming novel, Artemis Awakening. I must admit, I’m really, really pleased with this cover. For me, the first thing that I saw was the puma’s face. However, I’ve heard from a few people that for them the puma took a moment to resolve out of the swirls. I’m curious. What did you see? A puma’s face against a star field or a stellar nebula with a puma’s face at the heart? Often the author has no idea what the cover art will be until it’s already done. This time, courtesy of the book’s editor, Claire Eddy, I was asked if I had any thoughts to contribute. Since I’ve long been fascinated with what makes a book cover “work” or not, I was thrilled to be included. My first thought was that I would prefer an iconic image to an illustration. Probably because I’m the author, book cover illustrations featuring my characters rarely look “right” to me. This doesn’t mean the cover is bad, just not to my taste. Also, I realized that as a book buyer I’m more likely to be drawn to an interesting image than to picture of what may or may not be a scene from the book. I realize that this is not the case for everyone – and I can certainly think of times when an illustration cover has caused me to pick up the book. Several of Michael Whelan’s covers for Joan Vinge’s novels immediately come to mind. I also wanted a large image, one that could be seen either across a bookstore or in a thumbnail image on a screen. A cover like that for The Buried Pyramid, lovely as that painting is, would be lost in either of those situations. So what iconic image might I suggest? Artemis Awakening is a fairly complex book. I couldn’t think of any one image that would encompass it all. Very well, if not one image, how about a combination of images – especially images that wouldn’t necessarily occur together in the world as we know it but make sense in the context of the novel? Then it hit me. I can’t draw, but I have several friends who can. I put out a request. I felt very fortunate that Cale Mims had time to take out his sketchbook and pencils. He provided me with several interpretations of the “puma holding planet” idea. 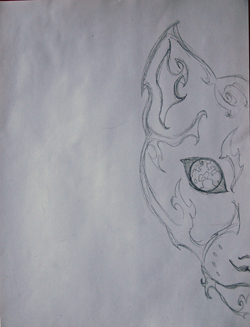 Cale drew another image, replacing the puma’s eye with a planet. He decided to experiment with using half a face, rather than a full one, because it would leave room for title and author name, as well as being more iconic, less an illustration. He also added some understated flourishes, similar to tribal tattoos. 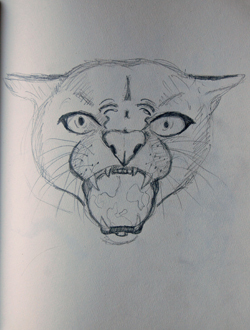 However, the half-faced puma idea definitely caught interest. The idea evolved to include a star field for a background. After this, I heard nothing more about the project except for an update in August that the cover art was indeed underway and we should see it within a month or so. Then, last week, Claire sent the image above. I was fascinated how, at the hands of artist Cliff Nielsen, Cale’s original drawing had evolved, but was still recognizable. The star field was there, but now included swirling veils that reminded me of nebulas, melding the puma into the heavens in a very interesting fashion. Cale’s touches of tribal art accents had been retained and emphasized. I hope you like it… And I hope you’ve enjoyed a glimpse of the process by which this particular book cover came to be. This entry was posted on October 2, 2013 at 1:00 am and is filed under My Stories. You can follow any responses to this entry through the RSS 2.0 feed. You can leave a response, or trackback from your own site. It is a pretty image, but I’ll admit, my first thought was that it was a lion with a mane and a goat’s eye. I only saw it as a puma after I started reading. Oddly, it looks much more like a puma when it’s scaled down to Amazon display size. Personally, I hope my views are idiosyncratic and irrelevant, and that it sells well with that cover. I’m looking forward to reading it. I love it. I think this was a fascinating idea for a cover and using the planet as the eye was genius. I saw the puma’s face right away. Great cover!! I’m looking at it on an iPhone screen and even at that size it pops! Love the blending of the puma face with the swirling lights of a galaxy. Can’t wait for the book itself! Awesome cover – very intriguing! I saw space first, then the cat face, and love how the image works both ways. I also prefer iconic images to illustrations, and this really works! The image and the title should prove eye-catching on the shelves. Of course, as Peter said, the most important part of the cover is your name! I love the thematic images rather than straight up illustrations. I find it distracting when I’m constantly battling in my head between the images I’ve seen on a cover and the images being described by the author, so this is totally up my alley. I also love how they kept hints of that tribal pattern from Cale’s original drawing. A really tasteful way of using the sketch. Wow, this is a gorgeous cover! I love everything about it. 😀 I’m not sure what I saw first; puma or galaxy. All I knew was that it was beautiful, and especially so once I got a closer look and saw the glowing eye and the tribal-like markings. I definitely like this sort of cover better, since it tends to use imagery and symbolism geared directly towards the book more than a conventional cover might. And you do have a point that scenes and characters depicted on the cover of the book might have nothing to do with the actual book, which is always something I keep in mind when viewing a book’s cover. Then too, the subtlety of this sort of cover is appealing because it’s kind of mysterious, and makes you want to see what the book is about. I know with my magpie tendencies that if I saw this cover across the store I would zero in straight away to see what it was about. I’ll admit, since I seam to remember (perhaps incorrectly, it happens) that this was the one that features as you put it, “time, towers and foxes”, I was looking for a fox. So at first I only saw the star field on the nebula. Once I found fur, I was still looking for canine, or rather vulpine, features. But I soon realized it was a big cat I was seeing. I too like the art though. It’s pretty enough to get the first look, then interesting enough to draw interest in the book itself. It’s a perfect tease. They did a good job. Though for the record, I’m with Tor. The cat with a planet in it’s mouth image… no. Just doesn’t work some how. Sorry. Nope… This is the one with pumas, alien planets, crashed space shuttles, and long buried (in some cases literally) secrets. Love it! I often like graphics better than illustrations for a book cover. (I agree with what Rowan says…I hate it when the description I’m reading doesn’t match the cover art. It’s an intriguing image and you really have to look at it to see what’s going on in it. That just pulls you in. Oh my goodness! I soooo excited! I cannot wait for this book! Aww, Jane! Thank you for mentioning me on your blog – it’s such an honor! Cliff Nielson did a fantastic job!! When I grow up, I hope I can be half that good. 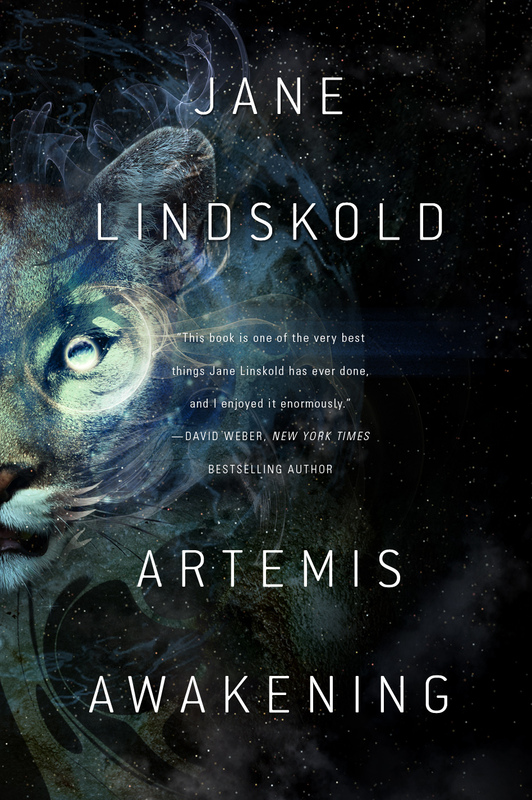 I think it looks really intriguing, and I would pick this up to see how the various elements (the star field, the puma, the cool lens flare planet) were tied together in the story. I’m looking forward to buying my own copy of this. Also, I checked Amazon and it looks like they have the novel available for preorder. Woohoo! I’m really glad to see my enthusiasm is shared. It’s interesting to hear how many people needed to look to see the puma face. I wonder if I was influenced by knowing the design in advance? It’s a beautiful cover. I admit I did not see the feline. I thought it was a nebula with an eye, not a puma with a planet. If the cover has a wraparound spine, I might have caught on it more quickly. I really like this cover. It reminds me of one of my favorite artists from SF past, Virgil Finlay.